Nothing is worse than a hot shower suddenly turning cold because someone has flushed or turned on a tap elsewhere in the house. If that is something you experience in your home or apartment, then it’s time to buy a new water heater. Buying a water heater is not as easy as shopping for other household appliances, as these devices have specs most people don’t really understand. That’s why we’ve compiled a list of reviews of the best water heaters regular buyers can consider. What is the biggest problem most household water heaters have? Low capacity that makes the gadget unreliable for handling the whole house. You can say goodbye to such problems with this Japanese-made Takagi water heater. This can easily handle an average home with two floors thanks to the 6.6 GPM max flow rate. This water heater is tankless. It has a maximum BTU of 140,000 and a minimum BTU of 19, 500. Install this heater with 3/4-inch pipes to maintain an ideal water pressure that can be pumped around the house. It only requires a 120V AC plug-in port. The heat exchanger on this device is copper. It weighs only 38 pounds so it’s relatively lightweight. But how hot can the water get with this heater? Water can get as hot as 167 degrees at maximum. The lowest temperature setting is 122 degrees. Installing this heater would require a 4-Inch category III stainless steel venting. This Takagi heats water by a propane-powered flame powered. Some may not like it, but the heater is Energy Star certified. The water heater can automatically adjust the flame size depending on the need. If more water is flowing, it will auto-adjust the flame to be bigger or to heat water faster. The Takagi is quite expensive. But you can get uninterrupted hot water for well worth the price. 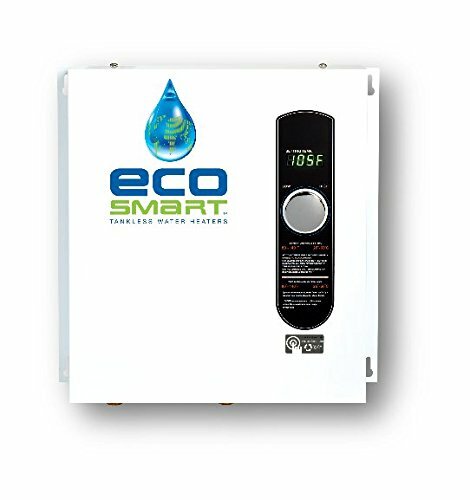 EcoSmart ECO 27 is one of the largest tankless water heaters money can buy. It can pump water even to a large 3-bathroom home with the right type of pipe. So what else makes this water heater special? It’s fully electric. There’s no messing with gas or fuel when you have this water heater. The ECO 27 is highly energy efficient and can save up to 50 percent of water heating costs at homes. It works fast too. This water heater can warm up to 3 gallons of water per minute. You can run two hot showers at once without feeling cold water. This water heater is designed for cold climates in North America, where water can be as cold as 37 degrees. No matter how naturally cold the water it, this heater can quickly warm it up. If you live in a warmer climate, such as the southern U.S., this heater can warm up to 6 gallons of water per minute. It makes it particularly suitable for high-demand applications. You can increase the temperature of water in one-degree increments for convenience. The heater can handle temperatures between 140 and 8 degrees. This water heater can be a bit difficult to install. But if you hire an electrician, the warranty is nullified. It may not be cheap, but the Stiebel Eltron Tempra 29 is one of the best electric tankless water heaters you can buy. This can deliver comfortably hot showers and you won’t even notice that no tank was involved. This is an upgraded product from the previous Tempra version. It’s available in multiple kW capacities ranging from 12 to 29. The water heater has advanced flow control. 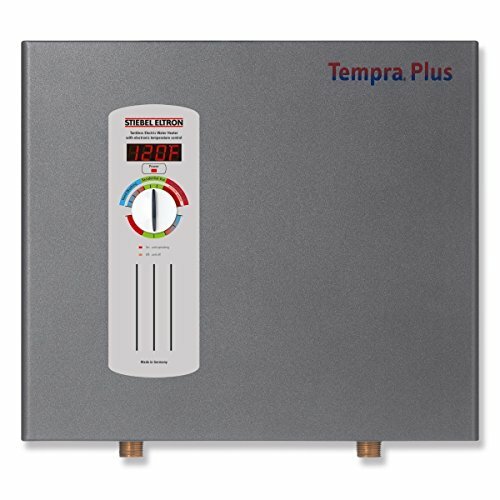 This German-engineered product also has a very convenient digital display that you don’t get with other water heaters. It can be installed easily. However, you will need to buy several parts that don’t come with the packaging. As an electric water heater, it’s convenient. But it’s not particularly energy efficient, so it requires a lot of electricity that your home’s panel will need to be able to handle. Automatic detection of water flow rate temperature. Users can set the temperature to anything between 86 and 125 degrees. The heater can handle high-demand tasks. It’s possible to run two showers at once with this heater. No venting is necessary, unlike with gas water heaters. This natural-gas water heater is expensive. But it offers amazing perks that users can enjoy in the long term. This heater uses about 199,000 BTU of gas. It’s listed as about 94 percent energy efficient. So if you are worried about energy costs while using a gas water heater, don’t be. This highly efficient system will keep the costs down. This water heater is equipped with a self-diagnostic system for servicing and installation. Users can easily spot problems even if they are unfamiliar with electronic devices. This water heater has a digital display that conveniently shows not only temperature settings but maintenance codes as well. If you live in a high-demand house or apartment, you can combine two units to operate as one using an EZ-Link cable. You can manifold up to 20 units! This water heater can work in harsh environmental conditions, such as high altitudes up to 9,840 ft. The unit has freeze protection down to -30°F. This gas water heater doesn’t suffer from the “cold water sandwich” problem severely. It can take a while for the water to heat up, but once heated, the water stays hot. 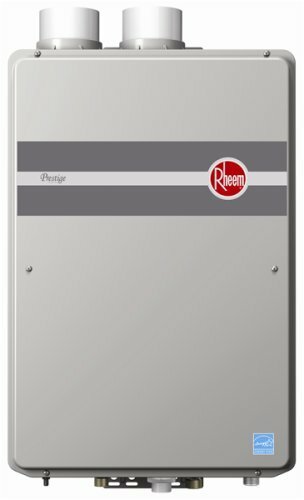 Gas water heaters include those that can be powered by natural gas, propane, or both. Gas water heaters are highly recommended for large families. These devices can warm up more water per hour than any other type of water heater. If you live in a high-demand house, do consider investing in gas water heaters. Gas water heaters are also known to be energy intensive. However, this really depends on the brand and model you are using. Generally speaking, the energy intensity gap between gas and electric water heaters is bridging. Gas heaters are fast. A gas water heater can heat a 50-gallon tank in an hour. On the other hand, it would take several hours for an electric tank to do the same. Gas water heaters still work even during a power outage. Gas water heaters are not known to be energy efficient. You will have to spend more on a gas water heater than an electric one. There’s also more heat loss with gas heaters because water is being heated all the time. Heat will seep through the walls of the tank. Gas water heaters must also be regularly and diligently maintained. These tanks can explode without proper maintenance. Gas water heaters require a gas exhaust. That means more piping. Gas tanks are only ecofriendly when using natural gas. Even so, exhaust will occur. Now, electric water heaters are highly convenient to use because you don’t need to connect it to an exhaust pipe or a fuel source. Electric heaters, unlike the gas versions, heat water on demand. These devices warm up water when in use and cool it down when you turn the heater off. Electric water heaters are generally more energy efficient than gas heaters. You can definitely save a lot of money with an electric water heater. If you want to be more ecofriendly, you can power up one of these using solar panels or a battery system. Some electric heaters can be directly powered by solar energy. Electric water heaters are also more compact compared to gas water heaters. That’s mainly because the electric heaters don’t need space for exhaust. These heaters may not be able to handle high demand rates. The heater takes time to recover, so larger families may have to wait for the device to start working. You should consider the pros and cons of both types of water heaters and choose the best version that matches your needs. Water heaters with tanks store water and heat it up for use. 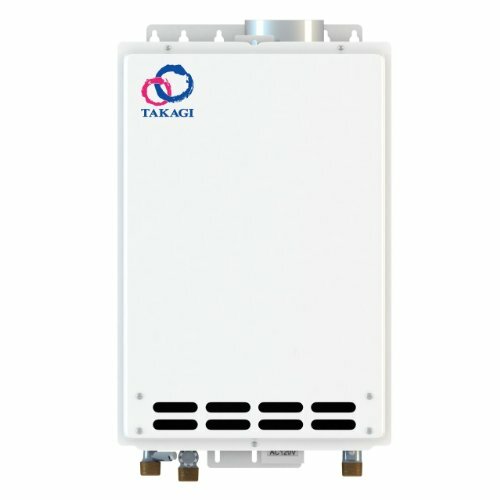 Tankless water heaters heat up water on demand. Generally, gas water heaters have tanks. Electric ones can be plugged inside the shower to heat water as you shower. Water heaters with storage cans can be limited in use. If a family uses up all the hot water in the tank, it would take a while to fill up the tank and reheat the water again. Heaters with water tanks also take up more space. You will need to find extra space to accommodate the storage tank. Water tank heaters, however, can help you control water use at home. But these can also become extremely inconvenient. Perhaps that’s the reason why tankless water heaters have been on the rise in terms of usage. You can use these heaters to warm up water any time you need without having to wait. Do you want to know how hot the water is in the shower? Modern water heaters come with convenient digital displays that you only have to glance at. Of course, this feature is largely limited to newer models and electric water heaters. But it’s worthwhile having. Now what type of pipe is needed to adequately pump water out of a heater at a certain level of pressure? The piping associated with the water heaters is extremely important to look at. It should match what you have in the home, or you will have to buy new pipes. The BTU rate you see with gas water heaters. That requires the amount of heat required to heat up a pound of water by a single degree. You can save energy costs by buying a highly energy-efficient water heater. Look for Energy Star rated heaters if you can. Make sure you understand the manufacturer’s warranty before you make a purchase. Some warranties can become invalid for things as minor as hiring an electrician to install the heater. Buy a water tank with a digital display to read the temperature. It can also help you spot potential issues with the heater early on. See if the valves located at the bottom of some water tanks are brass. Plastic valves don’t last. Water heaters can vary in price, type of water storage, and type of fuel used. When purchasing, what you really want to look at is whether the water heater can match your requirements at home. Therefore, we recommended that you make a list of things you want with a water heater. That should help you choose the right type of water heater you need.